Members of Beach Ambassadors recently visited St. Mary’s Home to present a check for $7,012 — 75 percent of the proceeds from the group’s Battle of the Beers event. While at the Home, they met 6-year-old Adrian and a special jolly guest. Standing, from left: Shannon Edsall, St. Mary’s development associate; Beach Ambassadors member Philip Casone; Beach Ambassadors President Jeff Hubbard; St. Mary’s CEO William C. Giermak; Mary Helen Hilton, St. Mary’s director of annual giving; Shirley Justice, St. Mary’s community liaison; and Martha Price Stewart, St. Mary’s director of development. Seated, from left: Marlin “Mo” Patrick, a Dominion Virginia Power employee who’s been visiting the children dressed as Santa Claus for years at the holidays; Adrian, who lives at the Home; and Beach Ambassadors member Andy Beale. 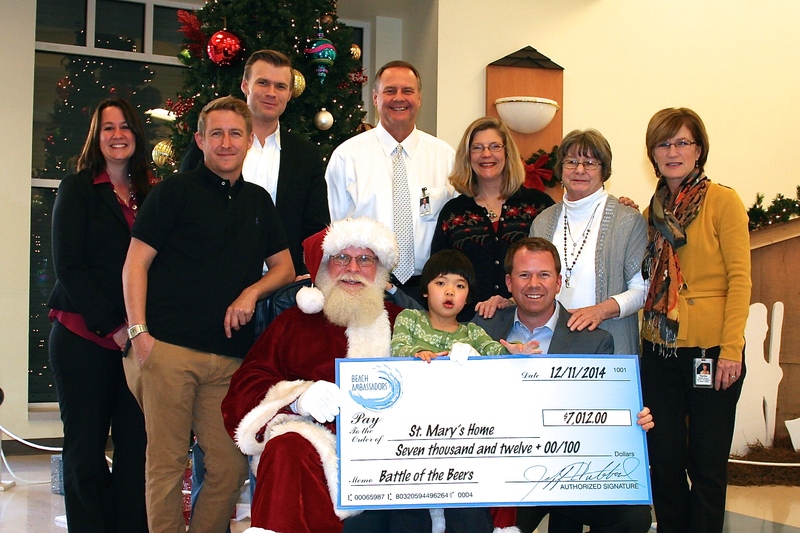 NORFOLK, Va. (Dec. 16, 2014) — Beach Ambassadors recently raised more than $7,000 to help children and young adults with severe disabilities who live at St. Mary’s Home. Beach Ambassadors supports local charities through community service projects, as well as social and sporting events. Members have volunteered at St. Mary’s Home, helping children swim in a therapy pool, assisting with therapy dogs at the Home and decorating for a fall festival. Members returned to St. Mary’s in early December to present a donation of $7,012 — 75 percent of the proceeds from the Beach Ambassadors’ Battle of the Beers among local breweries, held Oct. 25 at Tapped Gastropub in Virginia Beach. At the Home, the Ambassadors met with some of the children and a special guest, Santa Claus (portrayed by Marlin “Mo” Patrick, a Dominion Virginia Power employee who has been visiting the children in costume during the holidays for years). St. Mary’s CEO William C. Giermak said the Home is fortunate to have friends and supporters like Beach Ambassadors, at the holidays and throughout the year. “They help make it possible for children and young adults with disabilities to be happy and healthy while receiving the complex care they need,” Giermak said. St. Mary’s Home provides around-the-clock, specialized care within a homelike environment for Virginia children and young adults with severe disabilities. With the opening of The Albero House at St. Mary’s in 2013 to provide care for adults 22 and over, St. Mary’s shortened its name from St. Mary’s Home for Disabled Children. Todd Collins, general manager of Checkered Flag Volkswagen & Hyundai, holds the Good Corporate Neighbor Award he accepted for the dealership at a ceremony Dec. 3, 2014. With him are, from left, Clare Davison, president of St. Mary’s Auxiliary; Shannon Edsall, an Auxiliary member and project manager and development associate at St. Mary’s; Martha Price Stewart, St. Mary’s director of development; St. Mary’s CEO William C. Giermak; St. Mary’s CFO Wayne Jones; and Pete Lively, vice president, director of variable operations, at Checkered Flag Motor Car Company, Inc.
Our friends at Checkered Flag Volkswagen & Hyundai in Virginia Beach were honored today with a Good Corporate Neighbor Award at the VOLUNTEER Hampton Roads 2014 Corporate VOLUNTEER Excellence Awards. The dealership was recognized for its support of St. Mary’s Home. Congratulations, Checkered Flag VW! Congratulations also to Steve Fredrickson, chairman and CEO of PRA Group, for being selected as the 2014 Corporate VOLUNTEER Leadership Award Honoree. Fredrickson is a director of St. Mary’s Foundation Board. 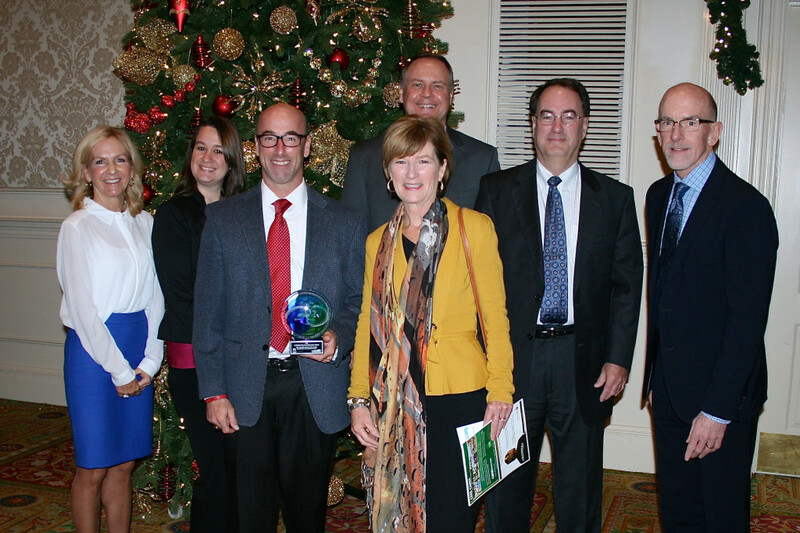 The Hampton Roads Corporate VOLUNTEER Excellence Awards are presented annually by VOLUNTEER Hampton Roads, in partnership with the Hampton Roads Corporate VOLUNTEER Council and Inside Business. The awards recognize the vital role workplace volunteer programs play in strengthening our community and the workforce. See a complete list of this year’s honorees here. St. Mary’s was pleased to nominate the volunteers from Checkered Flag for a 2014 Good Corporate Neighbor Award. Checkered Flag employees first came to St. Mary’s Home for a United Way kickoff for managers in August 2008. Since then, they have been dedicated volunteers and supporters of our mission – to provide quality, specialized care within a homelike environment for children and adults with severe disabilities, so each person can achieve his or her fullest potential. “We could not accomplish all we need to do without wonderful, active volunteers like our friends at Checkered Flag,” said William C. Giermak, St. Mary’s CEO. Checkered Flag employees have dressed up as their favorite rock stars for several “Rock Star” charity sales events, donating proceeds to St. Mary’s. For the fifth year in a row, Checkered Flag VW is donating a car for St. Mary’s to raffle and keep all proceeds, making the dealership the presenting sponsor of our Auxiliary Board’s annual auction and gala. These dedicated employees also have stepped forward to volunteer on a number of occasions. For example, they staffed the Coastal Living House in East Beach for St. Mary’s for an entire week in 2011 when St. Mary’s received the proceeds from ticket sales for tours of the home. This August, 23 staff members from Checkered Flag VW volunteered over four days to help put together communication books for the children at St. Mary’s Home. Our school needed these communication books to help the children learn how to interact and communicate with others. The books allow the teachers at St. Mary’s to show the meaning of words and let the children choose words to indicate their thoughts. Most recently, 21 staff came to St. Mary’s to volunteer for the United Way of South Hampton Roads Day of Caring on Sept. 12. They spent the day helping our children and young adults take a break from the classroom to enjoy a Field Day, with fun events including wheelchair dancing and adaptive bowling. There even was a dunking booth. Children got their principal and physical education teacher all wet by using an adaptive switch to dump water over their heads.